We've now been making our Half Screwed Sangria every year the Half Corked Marathon has been around. We've made it with Cab Franc, Rosé, Chardonnay, and Merlot. It doesn't seem to matter what wine you use in this recipe it always turns out great. Here are the recipes for our Half Screwed Sangria and the Cucumber Gazpacho from Miradoro Restaurant. Enjoy! Wineries located on the Golden Mile Bench wine growing area near Oliver in British Columbia have submitted a proposal to become the first official sub-DVA "Designated Viticultural Area" of the Okanagan Valley DVA. An in-depth scientific analysis by scientists from Agriculture and Agri-Food Canada, Pacific Agri-Food Research Centre – Summerland (AAFC-PARC Summerland) has shown the area has a combination of landform, landscape position, mesoclimate, air drainage and soil materials that make it distinct within the Okanagan Valley, contributing to the production of unique wines. A group of producers in the area have been exploring the concept of proposing a Golden Mile Bench DVA since 2009. After much discussion, debate and an in-depth study of the region's terroir by Scott Smith, M.Sc. Soil Scientist with AAFC-PARC Summerland in conjunction with Dr. Pat Bowen, Ph.D. Research Scientist, Viticulture and Plant Physiology also at AAFC-PARC Summerland, the final boundaries were decided. Wine consultant, Rhys Pender MW of Wine Plus+ helped to compile the proposal. 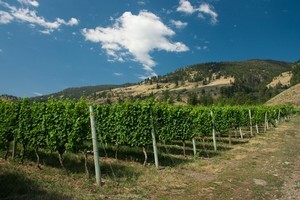 With the Okanagan Valley DVA comprising around four-fifths of all British Columbia's vineyard area, yet producing wines from many different mesoclimates and terroirs, it is a widely held belief that there is a need to break this large, single appellation into meaningful, scientifically unique sub-DVAs that produce distinctive wines. Golden Mile Bench is the first such application to the BC Wine Authority. The proposal was submitted to the BC Wine Authority (BCWA) on May 20th. The BCWA will conduct consultations within the region and a vote by ballot amongst the relevant stakeholders within the proposed region's boundaries. Once the due diligence has been completed the BCWA will submit the proposal to the Minister for approval. The proposal has been submitted to the BC Wine Authority who conduct the process as laid out in the Wines of Marked Quality Regulation before submitting the proposal to the Minister for approval. There is currently no existing time estimate. The boundaries were decided after in-depth analysis by Scott Smith, a soil scientist with the Pacific Agri - Food Research Centre (PARC) in Summerland in conjunction with Dr. Pat Bowen, a Viticulture Research Scientist also at PARC. The area of the proposed DVA has been drawn up using a scientific basis. Some producers in the area have vineyards both in and out of the proposed DVA and some vineyards are even cut into two by the boundaries. Also, any winery who buys grapes from within the proposed DVA can use those grapes to make a Golden Mile Bench DVA designation. When a sub-DVA is created, it applies to all of the vineyards within the defined boundaries. Any winery (not just those located in the sub-DVA) making wine from grapes grown within the sub-DVA could use the name “Golden Mile Bench” on the label of that particular wine. Rustico Farm and Cellars Ltd.